PBDG: Attack from Mars approaching set! TJ and Wade Move the Attack From Mars game to the set. TJ Byer has been generous to loan us his Attack From Mars with the Bill Ung UFO kits installed. It was moved to the set yesterday with help from Wade and Tanio. 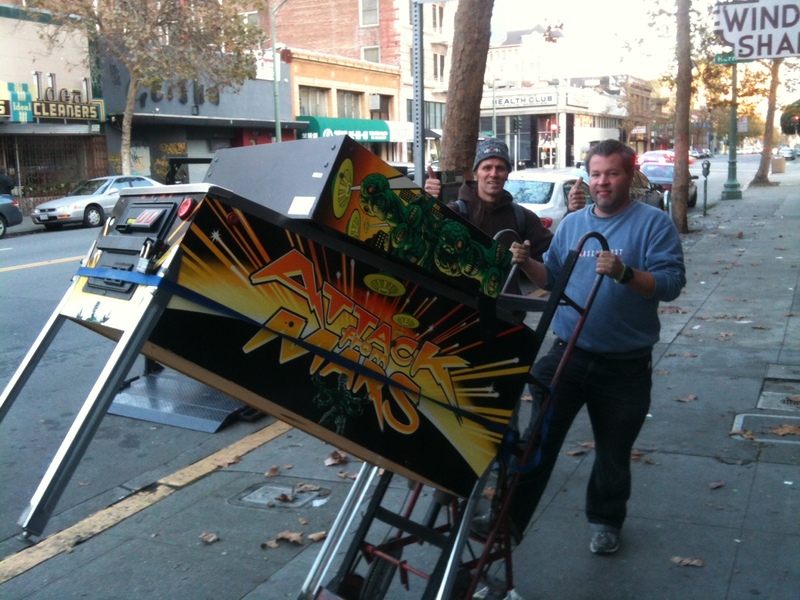 This entry was posted in Crew, News, Pinball People, Vintage Pinball and tagged Attack from mars, film, pinball by Anna Newman. Bookmark the permalink. TJ’s mint condition AFM usually resides at Disco Volante at the intersection of 14th and Webster in lovely downtown Oakland. When the game is done with its star turn in PBDG, it’ll be waiting for pinheads who like a drink and some good food with their game.